Roller skates are loads of fun and kids are sure to get a lot of joy from using them. However, one necessary point everyone must note is that to enjoy all the fun that comes with skating, kids certainly have to start practicing at an early age. Having a good pair of skates is also vital towards achieving that amazing and memorable experience. Figuring out a suitable and ideal pick for kids could be quite challenging as there are numerous models available on the market today but you can trust our 21 best roller skates for kids to point you in the right direction. This roller skate is well designed to grow as your child does. It is one which is aimed at helping kids master the art of skating in three different stages including the roll forward and back stage, roll forward only stage and the skate walk with one wheel locked stage. The aim of these skates is to help build confidence and ability in every little kid out there. They are also easy to adjust so as to perfectly fit any child’s feet. One feature which kids will enjoy about this gift idea is its well padded design which helps in ensuring maximum comfort. It also comes with a front stopper as well as durable quad wheels. 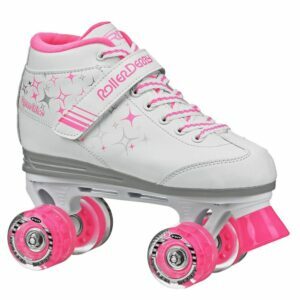 This is a roller skate specially designed for girls. 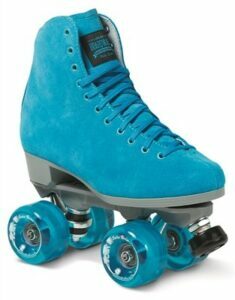 Riding with these skates means any girl will be able to grow her confidence. Parents don’t have to be worried about these skates pulling off thanks to their lace up design which guarantees that these skates perfectly fit the feet and ankles. They also come with a power strap at the top which helps in holding them securely in place. Maximum comfort is also guaranteed as they feature a well-padded collar. Unlike other low quality skates which one might come across on the market today, these skates are designed to have maximum stability so as to prevent unnecessary slipping. 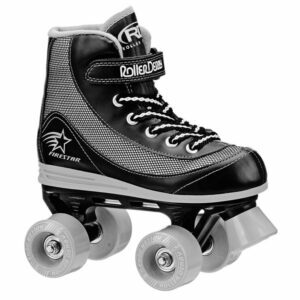 The urethane wheels also guarantee that these skates will glide smoothly across most terrains. The Derby Boys FIRESTAR skates comes with a secure strap at the top which helps in holding it in place against the ankle. The padded collar helps ensure the skates are comfortable when worn for long periods of time. These skates offer maximum stability so unnecessary slipping will not be a problem. This is a roller skate specially designed for boys out there. Boys will be able to grow their confidence when using these skates. They won’t have to worry about them pulling off, as the lace-up design ensures a perfect, snug fit every time. The skates feature urethane wheels which enables them to handle different terrains with ease. This is one that is designed specially for boys to help provide comfort while riding as well as improving performance. It comes with easy to adjust sizing which makes it possible to accommodate most feet and thanks to its lightweight and durable design, riders will find it extremely easy to turn. These roller skates can be used both outdoors and indoors. One feature that makes them stand out from other products on the market is the lightweight technology combined with high quality components. This means these skates are not only durable but also ensures they stand the test of time. They also offer stability and agility while the urethane wheels come with the ideal grip and balance needed to ride on any surface. Specially designed for both amateurs and more advanced skaters, these skates for girls offer top class performance and comfort at any level. The roller skates can be used on either indoor or outdoor surfaces, so they are ideal for a range of purposes. They are lightweight and made from high quality materials to ensure they are durable enough to last until they are outgrown. 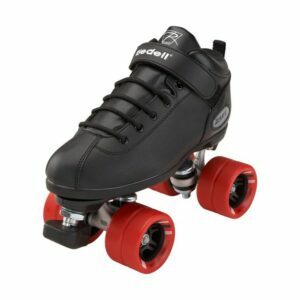 Like many skates, this pair features urethane wheels which offer enough grip and balance to handle different terrains. The skates make turning easy, and they are easily adjusted to fit different sized feet. 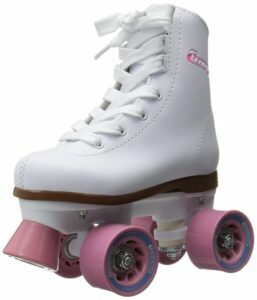 This is another reliable pair of skates which will provide hours of fun for your little princess. They are built for use both outdoors and indoors and one feature which makes parents love these skates is the toe stop design which helps offer great control while riding. Another impressive feature of these well-designed skates is their lightweight design which makes riders skate freely and with ease as well as being able to make sharp turns when necessary. They also come with a Velcro strap as well as laces which allows the skates to be adjusted to fit perfectly. 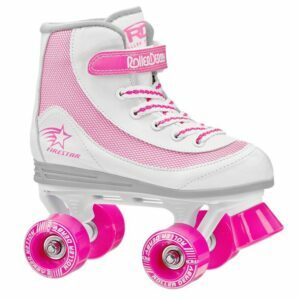 The white and pink design makes these skates attractive for girls, and the well-padded ankle collar design also helps in ensuring stability and comfort while riding. 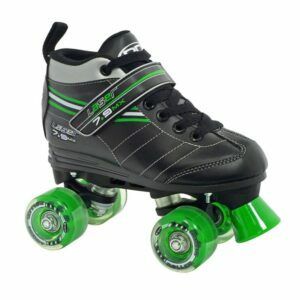 These easy-to-adjust roller skates are one of the best, most durable and most reliable picks. Even for beginners, there is absolutely nothing to worry about as this skate is designed to help your child perfect their skating skills. They can also grow along with your child. Optimal support and comfort are guaranteed thanks to the inner mesh and padded collar design. Parents can count on these skates to have a more secure and comfortable feel compared to lower-quality skates available today thanks to their dual micro ratchet buckles. Another feature that also makes these skates well-loved and widely used is the in-built toe brake which helps users stop effectively. Excellent grip and traction is guaranteed both outdoors and indoors. You won’t need to think about a replacement anytime soon, as these skates are built to last. This is a popular, iconic skate which comes with a high-top design that ensures young skaters are well protected while riding. The high-quality laces make sure the feet feel secure and comfortable while riding. The high-top boot design also provides maximum support for the ankles during use. These skates are made out of high-quality materials making them resistant to wear and tear therefore prolonging the product’s lifespan. Thanks to the high-precision bearings, young riders can enjoy fast and smooth traction and control to ride on any surface. The skates have an aluminum base which makes turning easy and effortless whilst the wheels are designed to make these skates suitable for outdoor and indoor use. Riding with these means smooth gliding both outdoors and indoors. They comes with urethane wheels which provide riders with the right amount of bounce and grip needed across most terrains. Despite having no laces to tie, this pair is still designed to provide the feet with all the comfort and support required while riding. This isn’t one that your kid would easily outgrow, rather they grow with your kid and can be easily adjusted up to four times with just the push of a button. If you have a child that loves to skate or has an interest in skating then this is the ideal gift for them. One impressive feature of these well-designed skates is the light-up design which makes sure your child will be noticed and stand out from the crowd. The lace and Velcro closure makes sure that the feet are secure and comfortable while riding. Thanks to the lightweight wheels, this is one pair everyone can count on to ride conveniently both outdoors and indoors. The toe stop design also makes it possible for riders to stop effectively when necessary. 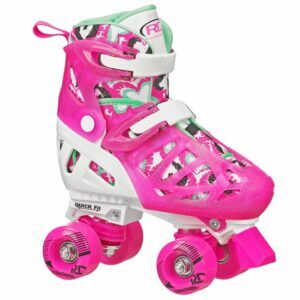 These are really eye-catching skates which younger girls are sure to adore. Featuring the perfect combination of value and performance, the Riedell R3 roller skate is certainly one of the best skates any parent can offer their child. 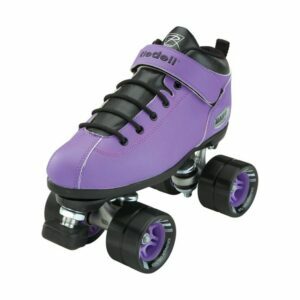 This purple pair of skates is popular among customers as it is famous for helping kids perfect their skating skills. They are made from vinyl which is both breathable yet durable, therefore offering comfort and practicality. They also feature top-quality ball bearings to minimize friction and offer an amazingly smooth ride. 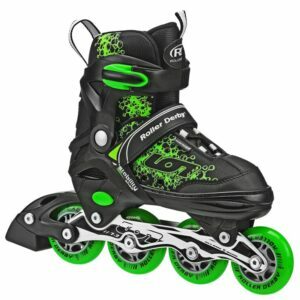 These skates are at the higher end of the price scale, but they are of higher quality than some of the cheaper skates you can buy, and are perfect for kids who have a keen interest in improving their skating abilities. Featuring exclusive bold red wheels and a matt black body, these skates will make your child the envy of others with their stylish good looks. They offer excellent value for money, as they have several impressive features which really makes them stand out against other skates on the market. They have durable ABEC five bearings that ensures maximum stability and support while riding. The upper and lining are designed to provide better protection, comfort and additional support while riding. 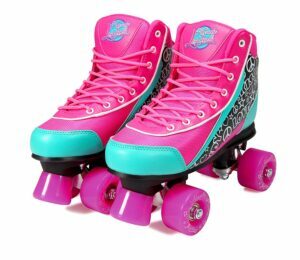 Kids will be able to stop effectively as these roller skates come with a midi gripper toe stop design, makes it possible for kids to stop quickly when necessary. 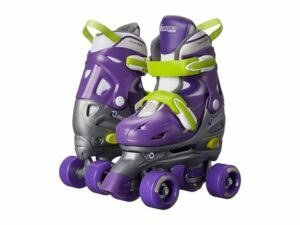 Durability is one of the stand out features of these well-designed roller blades – they feature an aluminum frame which makes sure they last longer than expected. They also come with strong urethane wheels that ensures riders can glide smoothly across all surfaces whether outdoors or indoors. There’s no need to worry about your kids outgrowing these skates anytime soon, as they can be adjusted up to four times to meet your growing child’s needs. Thanks to its straps and lace combination, kids will be able to enjoy a secure and comfortable fit when riding. This is a must-have for every girl out there and a pair of skates that any girl would love to have. They have an athletic-inspired design which doesn’t just make them attractive but also ensures they stand out from the crowd. 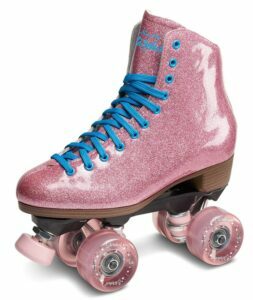 Riding these skates will excite your little princess, as the four wheels not only provide the stability to ride across any terrain, but also shine brightly to make these skates stand out from others. This is a good pair of skates to buy as they feature a combination of straps and laces which wouldn’t only keep the feet secure but will also help them feel comfortable. Durability is also one of the key features of this pair of skates as they are made using high-quality materials to ensure they last many years. Specially designed for every growing boy out there, this is one that will keep young boys excited each time they ride. Even if he is a beginner, there is absolutely nothing to worry about as this skate is designed to help your child perfect his skating skills. They are also made to grow along with your child so you can be sure they will last many years. Optimal support and comfort are guaranteed with the skates’ inner mesh and well-padded collar design. Excellent grip and traction is guaranteed both outdoors and indoors, making these skates suitable for a variety of purposes. The one feature that also makes these skates widely used is the in-built toe brake which helps in stopping the skates effectively. 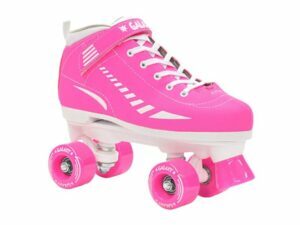 These attractive skates features two colorful laces and a beautiful, bold pink color which is perfect for girly girls! They are designed to promote comfort as it has a mid-top design aimed at making the ankles feel supported at all times. Durability is also another impressive feature of these skates – they are made using premium materials which ensure they will stand up to the test of time. 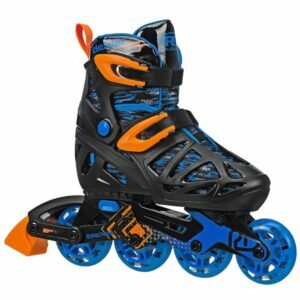 For those kids who love to skate or are eager to learn how to skate, these quality roller skates for kids are ideal to help riders improve on their skating skills. They offer a combination of comfort and performance which makes them one of the best, most durable and dependable choices that every kid would love to have. 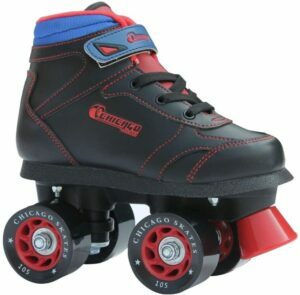 Riding with these skates is quite easy as they have durable urethane wheels which ensures it rides safely across all terrains. 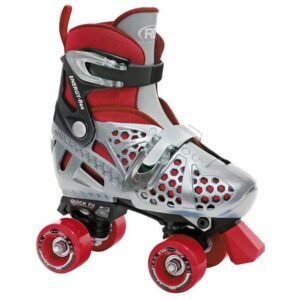 Riders are also guaranteed of a secure and perfect fit as this choice of skates comes with a Velcro and lace strap which makes sure it stays in place while riding. For every young rider, the Wiisham adjustable skates are designed to have a perfect fit. They come in a choice of two sizes, small which is adjustable from 10 – 13 and medium which fits kids with shoe size 1 – 4. 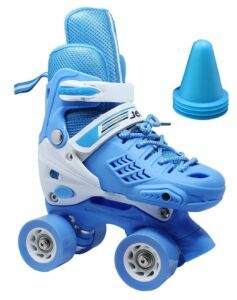 The blue skates features a lightweight torsion frame which enables riders to skate freely and make quick and sharp turns when necessary. 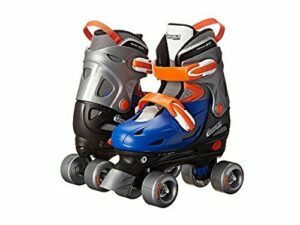 Unlike other lower-quality roller blades found on the market today, these well-designed skates offer excellent bearings which ensure the wheels roll smoothly every time. Durability and balance are some of the impressive features of these well-made skates. The vinyl boot design makes them stand out from the crowd with their attractive and stylish appearance. Additional stability is guaranteed as these come with durable ABEC-3 bearings. Riders can also skate both outdoors and indoors thanks to the sturdy wheels which glide smoothly across all surfaces. 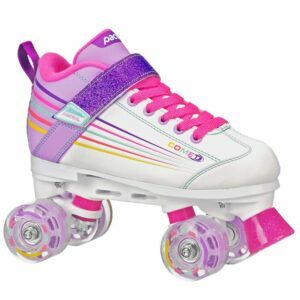 These skates are a must have for girls – they guarantee to get kids to their destination with great performance and in excellent style and comfort. With a well-stitched sole and made using top-quality suede, the sure grip blue boardwalk skate is one that offers maximum durability, practicality and style. These skates are designed for use outdoors, thanks to the 65mm outdoor wheels. They come with ABEC-3 bearings to help the wheels roll smoothly and evenly. The indestructible rock plate means these skates will last a lifetime if looked after properly. They come in adult sizes, so they are perfect for older children or teens who’s feet have stopped growing. Made using a high quality PVC material combined with a mesh design doesn’t just make these skates long lasting, but also guarantees they are breathable, to help get rid of moisture and sweat. The easy to lace design allows for a perfect fit. However, one feature which makes this pick popular among customers is the ABEC-7 bearings which work effectively in ensuring a smooth ride. Safety was also taken into consideration when designing these skates. The tight and high fit ensures that the ankles are fully protected while riding. They also feature amazing, bright colors which makes these skates really attractive and attention-grabbing. These skates are the perfect gift for girls who are keen to learn to skate or are looking to upgrade their existing pair. When considering what skates to get for your kid, the quality of the skate is of great importance. We have listed few tips below that you can look out for when considering which option to settle for. Comfort – this is a very important factor to consider. If the skates aren’t comfortable to ride, your child won’t want to use them and could end up with painful blisters. Roller blades should be made with materials that promote comfort so the feet don’t get fatigued when riding. Materials used – high quality materials used in making skates ensure they are resilient and durable. If they are made using low quality materials then you might find yourself looking for a second pair not long after buying the first. The excitement, thrill and speed that skating brings is something that every kid will love to experience. Skating can also be a special time of your kids life as it makes them happy. Not only is skating a form of exercise, but it is also considered to be a competitive sport. You never know, your child might be a future champion skater! The skates we have reviewed are all durable, safe and offer high levels of comfort. So, you can relax knowing you have made a good choice with any of the products listed above. We have chosen skates which are made to last, you can rest assured they will be enjoyed by your child for many years to come.